Posted in Baby Onepiece Bodysuits. 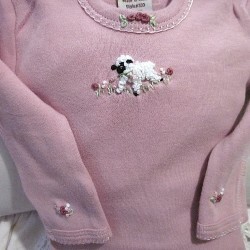 Tagged as 0-3mos., baby girl onepiece, baby onepiece, bodysuit adn pants, Easter, hand embroidered, infant bodysuit, lamb and flowers, Loved Baby, one of a kind, pink, rabbitwhiskers.com, Valentine gift. 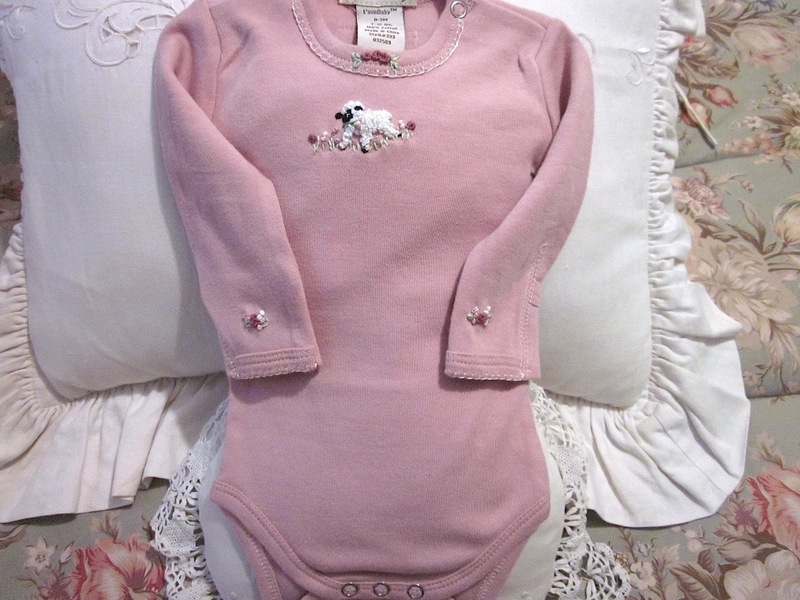 I’ve hand embroidered this adorable baby bodysuit to be one-of-a-kind. 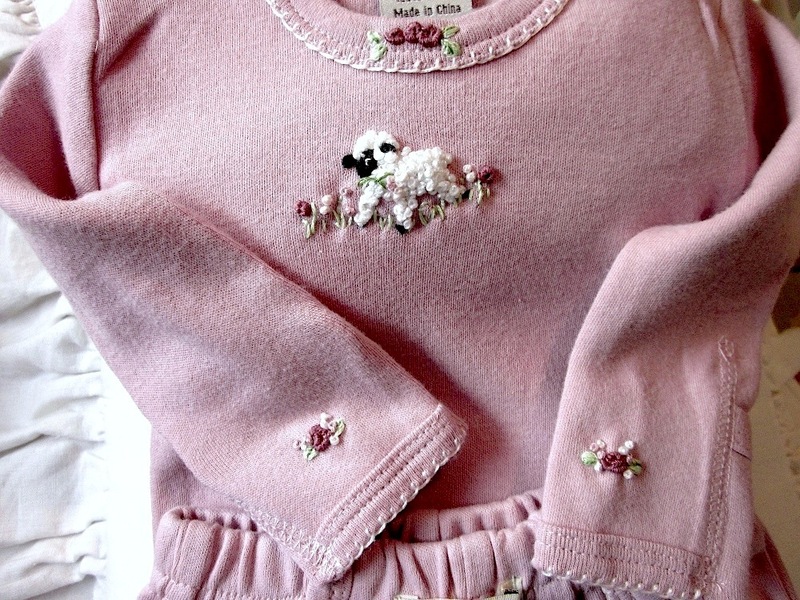 Made by Loved Baby, this is 100% cotton, top-quality infant wear. It is very soft to the touch and may be machine washed and dried~ and worn again and again! 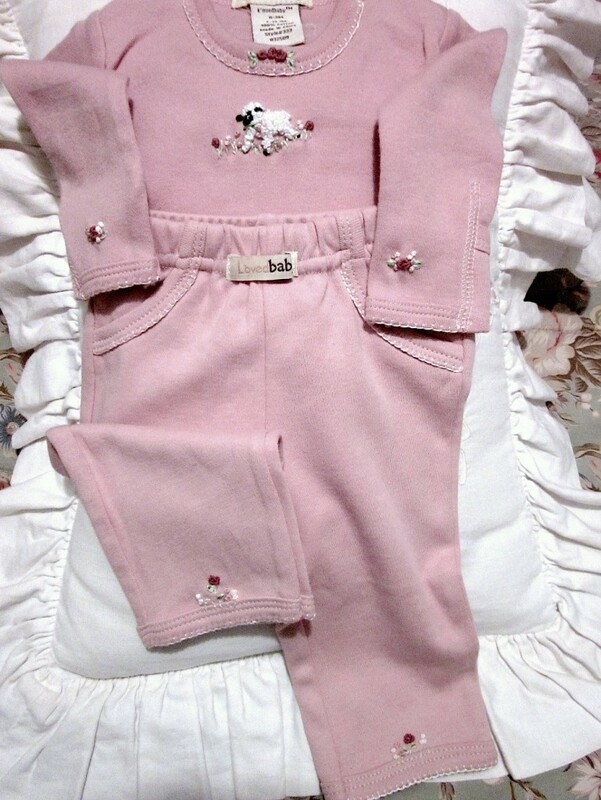 Both the top and the pants have been hand-embroidered in “baby-inspired,” detailed designs. 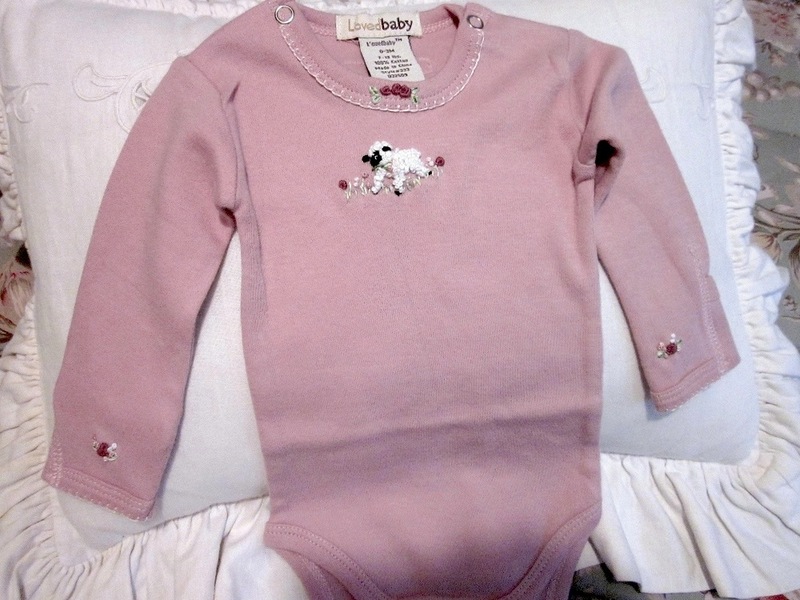 True to the scale of an infant, the designs are small so they won’t overpower and detract from the baby. 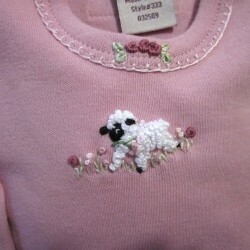 Because everything is so very tiny, these are quite difficult to embroider, as workspace in a baby’s garment is very cramped, requiring many hours of work; to give you an idea, the pants alone, took 5 hours to embroider from start to finish. 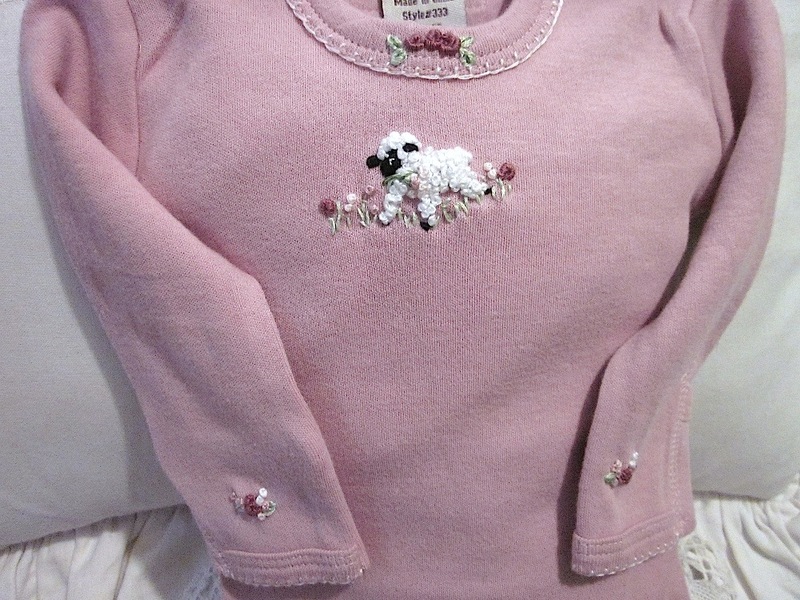 The entire neckline of the bodysuit is hand-embroidered with a pretty blanket-stitch in a soft, contrasting color. The front edge of the sleeves, also is embroidered in blanket stitch, leaving the backs free to fold over the hands if that is preferred. Embroidered in the center front of the neckline,is a motif of 3 roses with a pair of leaves on each side. 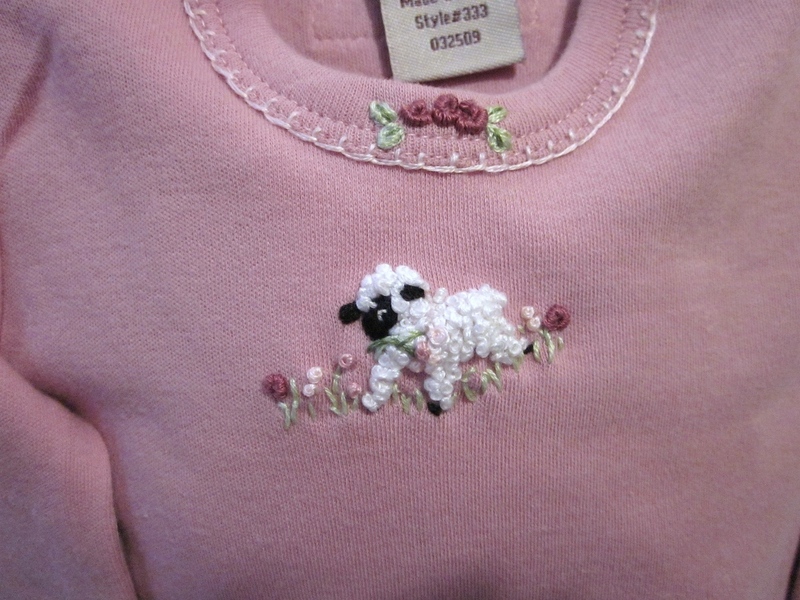 In the center of the bodice a hand embroidered, fluffy little lamb, stands in a “mini-meadow” of flowers. If you look closely you will see she even holds a few flowers in her mouth~ an example of the tiny detail that I’ve embroidered on these outfits. Centered above the blanket stitch trim of each sleeve I’ve embroidered color co-ordinated, matching mini bouquets. The pockets on either side of the pants are hand-embroidered in blanket stitch to match the embroidered trim on the bodysuit. The entire leg openings are hand-embroidered with the same blanket stitch. Centered above the trim at the bottom of each leg, I’ve embroidered a tiny, fairy-sized, flower garden in colors that match the flowers embroidered on the bodysuit. 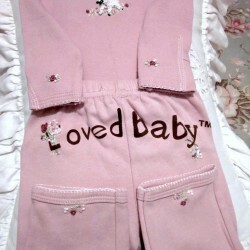 If you look at the fifth thumbnail picture to the right of the larger picture above, you will notice, when the pants are turned over to their backside, the words “Loved Baby” are printed across the seat. The pants come like this, with their cute trademark making a statement for all to see. I’ve embellished this trade mark by embroidering two bouquets of flowers, the larger of the two, weaves through the letter “L” while a smaller, “duet of flowers” swings from the letter “y”. * Due to the nature of embroidery, there are some threads, (embroidery floss,) that are exposed on the inside. I’ve kept these as trim as possible and used only short, well-anchored, stitches , so there can’t be a problem with threads being caught and pulled. Like the bodysuit and pants, the embroidery floss, also cotton, has the same soft quality and shouldn’t present a problem. * Some computer monitors may present slight distortions of colors. So that you know, this bodysuit and pants are a very unusual, soft, pretty shade of pink that is almost a mauve~ or a very soft shade of plum. It doesn’t have purple tones, they are closer to lilac or orchid. It’s very pretty! ** According to the manufacturer’s label, a size 0-3mos will fit a 7-12lb. baby. I have been told they run slightly on the large side.